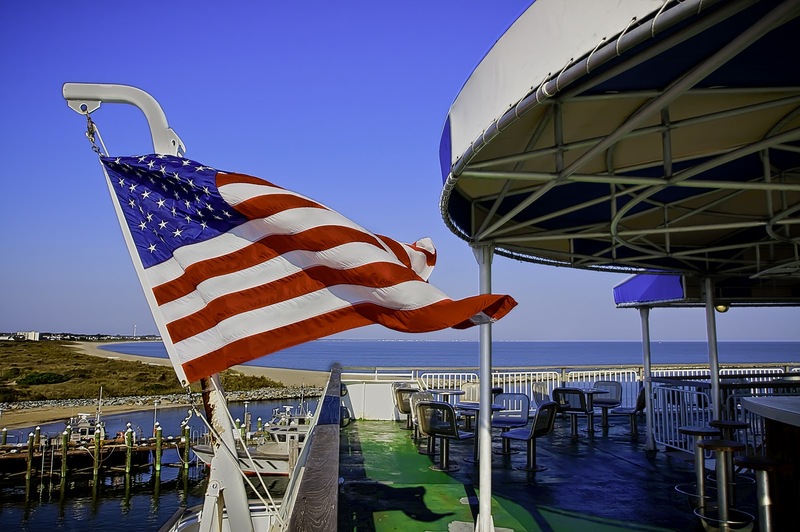 From the top deck of the Cape May-Lewes Ferry, overlooking the beach at Lewes, DE, the Nation's colors fly proud. This image was produced from three hand-held exposures with a 2ev spacing. 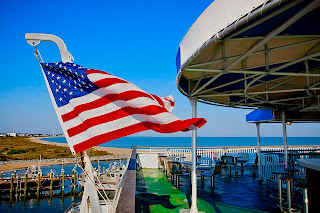 Captured on a pretty breezy day so the flag was all over the place, resulting in harsh ghosting. After attempting a merge in both Photomatix and CS5, I just couldn't get a suitable result so I opted for an alternative method. The three images were loaded into CS5 and blended manually using layer masks. The -2ev exposure, from which the flag was drawn, was loaded into Photomatix and used to produce a highlights and shadows map. This H&S map, using the hard light blending mode, was selectively blended into the flag via a layer mask to add detail. Saturation in Lab mode. Minor adjustments in Lightroom 3.